Mortar and pestle where all cream fits in. I bought a good priced granite one in a Thai shop and a small porcelain one in laboratory equipment shop. Please do not use wooden or metal one. 2 table knives, with straight (not serrated) blade. A beaker from heat-resistant glass where all lotion fits in. 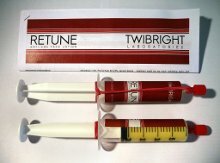 Syringes for measuring liquids and powders. Sizes depend on how much lotion you want to make. Other required substances are not in the International Pharmacopoeia. Please note Coenzyme Q10 capsules must be bought such that they contain liquid, not powder. Or Coenzyme Q10 drops can be used too. If capsules contain different amount than 30mg or you have drops, please recalculate the amount. Please note deionized water can be replaced by distilled water and doesn't have to be pharmacy grade. In the OpenOffice Calc file in sheet "Total" fill in the desired milliliter amount into the green field. In the red column you get volumes of ingredients needed, on the left expressed in grams. I buy the ingredients in a pharmacy. Plastic syringe caps, for their number divide lotion amount by 20ml. Replaceable by cutting a skewer end conical with a knife and cutting the tip off. But this presents a risk of such stopper falling out during transport. Red thin cardboard for making box (not critical). For their number divide lotion amount by 20ml. Please note that "levigation" is a pharmacy term for a way of mixing creams to homogenity. Levigation means mixing thicker and thinner parts in a way that we never put small amount of thick part into a thin one. We would just chase lumps around with the pestle forever! If we have large amount of thin part, we have to add the thin one gradually. Please note, table knives are useful when working with mortar and pestle to scrape material together without loss. One can clean one knife against the other. Please note, in water bath, place the water level at least as high as the lotion inside the beaker, but not so high that the beaker floats. Please note to measure several liquids in a row, you can first clean the syringe by blowing air with the syringe several times and then wipe the needle with paper. Then measure liquids without regards to bubbles. Between liquids, wipe the needle with paper. At the end, clean the syringe into the mortar by blowing air. I believe this method to be time saving and precise. In the OpenOffice Calc file in sheet "Total" fill in the desired milliliter amount into the green field. Follow yellow instructions on the bottom half of the "Total" sheet. I tested the cream first on one half of the face aginst a control consisting of hydrating lotion prescribed by dermatologist specialist. After some time I got convinced, the cream really works and makes the skin look younger. 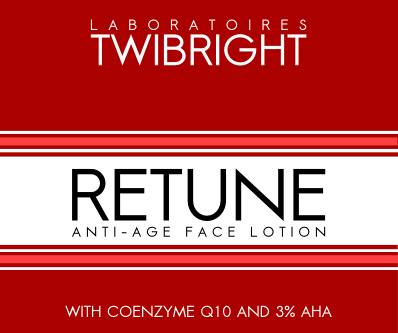 I tried a commercial product before (Lab Series Age Rescue Face Lotion Anti-Wrinkle) but got a mild irritation. I am not sure about positive effects of this cream. In comparison to this commercial product, I am very satisfied with my cream. Since then I cannot be without my cream, because I see my face so much more beautiful with the cream. I don't get any adverse reactions from the cream, not even eye irritation when put over the eyes. The reviews from about 4 friends I gave the cream are not so clear-cut. Noone got adverse effects. Some people say the cream is good without citing any particular positive effects, one friend (40's of age) claimed he cannot see any effect, but I saw his skin as smoother. I was concerned about the price of anti-aging cream and afraid and feeling helpless against the practice of angel dusting. I studied contents of several commercial creams and asked in pharmacies, which ingrediets can be bought. Then I decided to make my own cream. I designed the cream based on numerous studies and references and reverse-engineering og the ingredients lists of many commercial products, which are listed in the Retune leaflet. I tried to aim at easy availability of the compounds and aimed at commodity compounds, avoiding specialized proprietary products.